Trapping Turkey Vultures is not always easy. At least not near Hawk Mountain Sanctuary. Although we have caught and tagged more than 400 Turkey Vultures in northeastern Venezuela, together with 50 additional vultures in the Falkland Islands, catching vultures near the Sanctuary remains an all-too elusive endeavor. Having caught fewer than 20 here during more than six years of effort is frustrating to say the least. And it hasn’t been because we haven’t tried. Two years ago my good friend and capable colleague Alfonso Godino, an experienced trapper from Spain, managed to catch just a handful of vultures, most of them Blacks, during the early autumn of 2008, and this year Carmen Calero, another experienced trapper with considerable successful trapping experience in South Africa, is trying to do so again. Carmen, a Spring Intern at the Sanctuary, has been working hard for three weeks now, but only two vultures have been caught and tagged so far. Our efforts near Hawk Mountain are aimed at achieving two goals. The first is to lean more about the movement ecology of Turkey Vultures in eastern Pennsylvania. The second, and equally important, goal is to provide a source of wing-tagged vultures for our Raptor Challenge education program, which is teaching local school children about raptors and their conservation threats. The idea behind the latter is that if school children visiting the Sanctuary get to see tagged vultures at Hawk Mountain, they will become champions of the birds andtheir conservation needs. We have yet to figure out why vultures are so difficult to catch near the Sanctuary, but are our major concern is that food may be the problem…. too much food that is. Road-killed animals including Grey Squirrels, Virginia Opossums, Ground Hogs, Raccoons and White-tailed Deer are all-too-common in our part of the world, and chicken farms south and west of the Sanctuary also provide readily predictable sources of carrion in the form of dead chickens. So what’s a trapper to do? Carmen, persistent as she has been, hasn’t seen many vultures flying over her trap site this past week. And not seeing lots of vultures in the air is not a good thing for a trapper. But not to worry, we haven’t given up yet, nor do we intend to do so. In fact, we are about to move on to Plan B… which involves setting up additional trap sites in the hope of catching few dozen vultures before the summer trapping season ends. Potentially frustrating as all of this is, working with a field team that includes Hawk Mountain Research Biologist David Barber and Spring Intern Carmen Calero makes all this an opportunity to learn, rather than what could be a seemingly endless string of frustrating days. Sometime soon will figure all of this out, and when we do I will be back in touch with news of our success. In the heart of Kenya’s Masai Mara Reserve, four tourist vans were watching vultures feed on dead wildebeest. The hissing and gaggling cacophony of the vultures, which are one of the most highly threatened groups of raptors in the word, set the mood of a Tarantino movie. I was with collaborators Keith Bildstein and Marc Bechard, who were helping me to trap vultures so we could attach miniature cell-phone transmitters that would help us understand their movement patterns, critical in developing a conservation strategy. 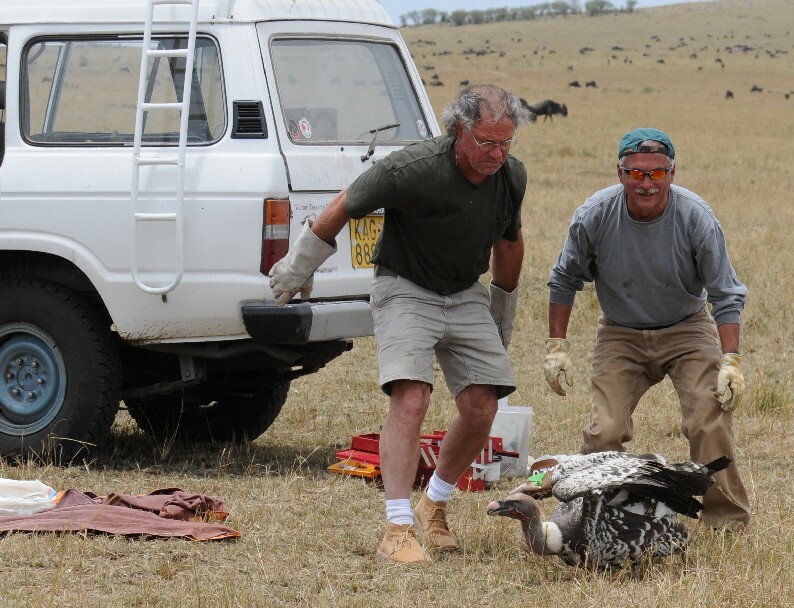 Poisoning and human-caused habitat change are the biggest threats to vultures in Africa. We scanned the horizon for lions. Thankfully none were around, as we were not equipped to deal with snared lions! We drove up to each van to let the tourists know what we were up to and were greeted with perplexed, unflappable faces all around with only one elderly lady showing any hint of excitement. I slowly steered towards the vulture feeding frenzy. The aim was to herd vultures on one side using the car as a blind while sneaking onto the carcass from the other to set the trap on the wildebeest. This particular one was extremely smelly and as I worked inches away from its head, my face was covered in flies. Every so often, I am convinced that these carcasses talk to me. “How many did you catch today, Munir?” they seem to say. I made a mental note to thank them in my publications for allowing me to use them to trap vultures. While I recovered the trap, I could hear thundering applause that got louder and louder. As I looked up, there were at least seven tourist vans with numerous heads popped over the roof giving us a standing ovation while cameras clicked away in frenzy! Not accustomed to this, I took my cap off, did a courtesy bow and said, “Thank you, thank you very much.” I got into the car, smiling ear to ear as we drove away to the shade of nearby tree to attach the transmitter and release the Rüppell’s Vulture. Editor’s note: Dr. Munir Virani is Head of the Peregrine Fund’s African research and conservation unit. Hawk Mountain, which is funding the cellphone tracking units, is working together with the Peregrine Fund and Princeton University graduate student Corinne Kendall in an attempt to learn more about the movement ecology of East Africa’s vultures. To learn more about the Peregrine Fund visit their web site a www.peregrinefund.org. To learn more about Hawk Mountain’s conservation activities visit its web site at www.hawkmountain.org. For a personal tour of the Sanctuary’s research center or more about how to lean how to support Hawk Mountain’s conservation work, email its Sarkis Acopian Director of Conservation Science, Dr. Keith Bildstein at Bildstein@hawkmtn.org. 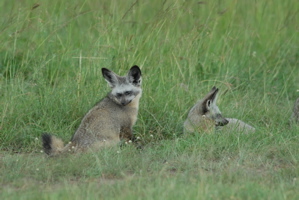 Other fun and unique sightings for the week included a rare close-up with a small group of bat-eared foxes. Usually these little carnivores head right for their burrows when you drive near, but this group sat calmly but itchy as we approached. The whole group went through an immense scratching session as we watched with each individual using this back leg to scratch its giant ears (just like a dog) and then proceeded to groom its companions. We also had a nice moment with a group of Ground Hornbills, a gentle and clumsy bird that I know well from my time at the Houston Zoo. One of the long eye-lashed males came up by the road and posed for some photos, while his companion grabbed a huge grasshopper, which she carried around with her for a while afterwards – proud of her insect trophy. We ended the week with a rhino charge. A young black rhino came right at us, chasing the car for a few hundred meters before stopping and crossing the road behind us. It seemed unusual for such a young animal to be on its own. Then we had a male Kori bustard displaying (they try too hard, inflating their necks and raising their tails) and actually saw a female with an adorable chick. Like a miniaturized version of the adult but with soft feathers and well-camouflaged colors of yellow and brown the chick wiggled along after the female, as the two birds cooed and squeaked at each other to stay together even in the tall grass. It has been a week of lions. Everywhere we turned we saw one or the other. 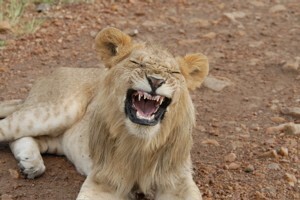 Unlike last week’s scrawny injured lioness, the big cats we have seen the last few days have been healthy and well-fed. A 12-member pride with two adult males, a juvenile male, and a female that resembles “Scar” from The Lion King (thanks to a warthog tusk that nearly removed her eye) sat happily with a buffalo kill. Then we saw a lioness with three large cubs – two girls and a boy. We stopped to watch them as they slept along the road. The male cub decided to cross right behind the car and I had a moment of panic as I absorbed the fact that I was only a few feet from such an impressively large animal with the windows open. He stopped just to the right of the car and lied down in the road. With the roof popped open, I stood staring into his deep yellow eyes while snapping a few shots. He yawned – big — and I got a nice look at his teeth. When he finally went to join the girls on the other side of the road, his affectionate head rub was welcomed with a snarl from one of the other cubs as he collapsed onto his side for a further nap. But the most exciting sighting of the week was not the lions. It was in fact a rare and endangered bird that I had yet to see in the Mara and which is believed to be effectively extinct in this area. 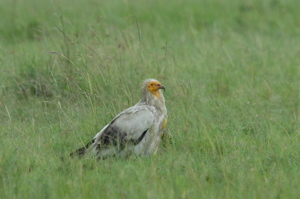 A beautiful adult sat with some Hooded Vultures not too far from the buffalo kill. Made famous for their egg-cracking talents (these birds actually use rocks to break open ostrich eggs), this adult sat calmly, totally unaware of the star-struck field biologist that was oggling him. I just couldn’t believe that after five months of fieldwork here, this is the first Egyptian Vulture I have seen. I would have loved to have known where this individual had flown in from, but I suppose I will just have to be content with the sighting itself. I’m sitting on the veranda by the dining tent, looking out at the Mara. The rolling hills of green can be seen in the distance merging with the golden yellow of the tall grass plains below. The Talek River babbles slowly beneath me, and the rains have slowed, though not quite stopped. The river still manages to flow around the rocks. It is cool and calm this morning, though the sun is up and soon its warm rays will warm the earth. This week the Mara has shared with me many of its hidden treasures, even as I zip around almost ignoring the wildlife to see the vultures (sort of like missing the forest for the trees, I guess). On Friday, for example, a leopard crept out into the road in front of our car. There was no one else around and big male seemed startled to be found. He moved quickly into the bushes and growled as I tried for a photo. As two tourist vehicles joined us he made a break for it, leaping effortlessly across a small stream and vanishing into the dense vegetation – probably not to be seen for several more weeks even with hundreds of people looking for him. The next day, we stopped for a chameleon who was crossing the road. In yellow and green, he wiggled back and forth before each step trying to keep the fascade of being a leaf blowing in the wind, going even as I stood next to him. When I bent down it was a different story. He hauled it to the nearest bushes, black spots appearing across his body as he flashed his rage in color. Then slowly he returned to a dark green as he entered the bushes. On Sunday, we saw what appeared to be one of the last small groups of White Storks. These migratory birds which had overrun the place for the last month, are finally moving on. It has been amazing to see the “other” migration, not of wildebeest, but of all the migratory birds that travel through Masai Mara this time of year. After having seen flocks in the hundreds blacken the sky in synchronized motion, this group of 20 seemed pitiful. Then one bird leaped in excitement, its yellow beak flashing as it lifted a three-foot snake into the air. It flew with it trying to escape its hungry neighbors and stood for a while as if unsure how to consume its unusual prey. On Monday, we would see a similar display but perhaps from a less awkward predator, as a Tawny Eagle ripped a small snake into pieces along the side of the road. The next day, I saw the female lioness who I have come to know so well. She stood wobbling next to the road and it wasn’t just her paw that was injured anymore. That injury had cost her dearly and the once-healthy lioness that I had seen so many times had deteriorated into a skeleton of cat, ribs jutting against her skin and hips exposed and sagging. Her pain seemed to have extended as she was not only limping now, but also staggering, perhaps stiff from all her lying around. I wondered how long it would be before the predator fell prey to the scavengers and the vultures returned her to the ground. Large carcasses are scarce this time of year. With the tall grass, the herbivores have plenty to eat and the big cats and hyenas have a hard time catching their prey, who have freedom to roam wherever they please. The cheetahs seem to be the only ones having any great success, perhaps because they rely more on speed than stealth. There also aren’t a lot of animals dying this time of year, precisely because there is so much lush food and water to go around. There are still calves being born, some of whom won’t make it and the occasional diseased or injured animal that might keel over. Needless to say, the vultures have to work hard to find their food and when they do discover something, they work even harder to ensure they get a bit. Yesterday we came across a large carcass – we of course followed the vultures to find it. The dead animal was covered in birds with only the black tufts of fur around the ankles exposed enough for me to id the unfortunate individual as an impala. A few Tawny Eagles, a pair of White-headed Vultures, and a small squadron of Lappet-faced Vultures lined the outer rim of feasting African White-backed Vultures. From my studies, I imagine these early arrivers had each had a go at the carcass before the mass of small, struggling white-backs took over. Perhaps the Tawny Eagles had found it and enjoyed a piece of liver in the nearby tree after the Lappet-faced Vultures had quickly opened up the animal. 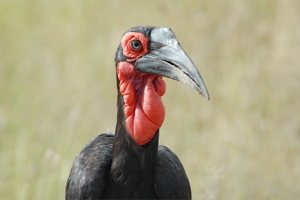 The White-headed Vultures might have gotten a few bites from the limbs as the Lappets pulled away at the skin. Now these birds would have to wait – the African White-backed Vultures had arrived. Like rugby players before a match, these relatively small vultures huddled together in a circle, shouldered wing to shouldered wing, crowding out their opponents. Unlike the rugby players, even the center of the circle was filled as new birds landed in the middle often stepping on their neighbors bloodied heads to get to the center of the carcass. In less than ten minutes, more than 100 White-backed Vultures had come and gone. In all the struggle only a few had eaten their fill, but those that were full now beared the weight of a huge crop, which sagged below their necks. As the number of white-backed vultures died off, the larger Lappet-faced Vultures reclaimed dominance of the carcass fighting and jumping on the smaller vultures until they moved off. The Lappets now grappled with the tough bits of meat left behind – the ligaments on the legs, the head (minus the eyes of course which are usually first to go when the white-backs arrive, a sort of delicacy in the vulture world), and the skin. Hooded vultures and a Marabou stork gathered around grabbing whatever small pieces they could – a scrap of stomach lining or a vertebrae, which the Marabou storks can swallow whole, that had been ripped off in the fray. With the hoard of White-backed Vultures gone, the other species tried to glean whatever small pieces they could, but with so little left none of them would leave with a full crop sagging, like some of the white-backs had. Amazingly no hyenas or jackals found the carcass. Perhaps because of the dense vegetation that surrounded it, which would have impeded our drive to see the birds had it not been near an old road. No this natural mortality, which never required the tooth and claw of a predator was the prize of the birds alone. When people come to Africa they come to see the Big Five. I’ve always found it a bit odd how the five most important species for hunting have somehow transferred their significance to the camera-wielding tourist crowd of present day. Most people aren’t even sure what the Big Five are, they just know they want to see them. Masai Mara has amble populations of all of the big five and occasionally people will see a rhino, buffalo, elephant, lion, and leopard all in the same day. Leopards are usually the hardest to find and although I have been fortunate enough to see one this trip in over a month that is exactly how many I have seen – one. But the leopard hasn’t been the only spotted carnivore avoiding me. I’ve seen surprisingly few Martial Eagles this season. Martials are your quintessential majestic eagle with deep yellow eyes, huge talons and a small grey crest at the back of their regal heads. They are mostly grey with a creamy white chest that is speckled with grey spots. Over the summer, I saw quite a few and one had even taken up residence in the nearby group ranch area of Koyiaki. 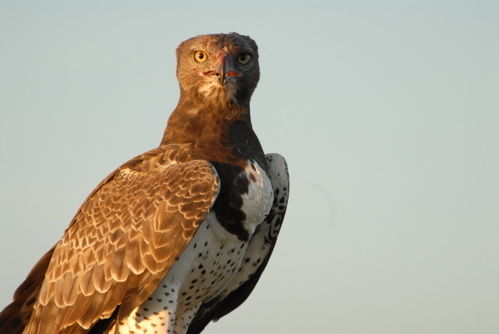 On my drive back from Nairobi a few weeks ago I saw a Martial eagle like never before. The huge eagle was sitting on a small shrub less than a foot from the road. Her crop was full – a bulging white sack at the base of her neck, showing that she had eaten recently. Even her beak was stained with red from her recent kill. She sat calmly as tourists stopped to admire the unexpected predator. I moved out of the way to watch her for a while. As she yawned and gulped, I noticed the kill. There wasn’t enough left to tell what it was, but the brown furry hide of some sort of antelope lay in the tall grass next to the eagle. Watching her capture and perhaps travel with that prey would have been something. Now she was all but ready for a nap. As the sun went down, I took one last look into her yellow eyes, wondering what small detail she might be staring at with her keen vision. Then it was time to go back to camp. Las personas vienen a Africa a ver los cinco grandes. Siempre creo que es un poco raro cmo las cinco especies ms importantes para la caza han traspasado su importancia al mercado de fotografa turstica de hoy en da. La mayora de las personas ni siquiera saben cuales son los cinco grandes, ellos nada ms saben que quieren verlos. El Masai Mara tiene poblaciones de los cinco y ocasionalmente la gente ve un rinoceronte, bfalo, elefante, len y leopardo en un mismo da. Los leopardos son los ms difciles de encontrar, he sido afortunada de ver uno en este ltimo mes, exactamente esa es la cantidad que he visto – uno. Pero el leopardo no ha sido el nico carnvoro moteado que me ha evitado. Para mi sorpresa he visto muy pocas guilas marcial esta temporada. El guila marcial es el guila majestuosa por excelencia con ojos profundos amarillos, garras grandes y una cresta gris pequea en la parte trasera de sus reales cabezas. Su coloracin es predominantemente gris con el pecho blanco cremoso con motas gris. Durante el verano, v bastantes y una -inclusive- haba una que se hizo residente en el cercano grupo de haciendas de Koyiaki. En mi viaje de regreso de Nairobi hace unas semanas pude ver un guila marcial como nunca antes. La inmensa guila estaba perchada en un arbusto pequeo a menos de 30 centmetros del suelo. Su buche estaba lleno – la abultada bolsa blanca en la base de su cuello, clara sea de que haba comido recientemente. Hasta su pico estaba manchado de rojo de su reciente presa. Ella estaba tranquilamente perchada mientras los turistas se detenan a ver el inesperado depredador. Me mov un poco para observarla por un rato. Mientras bostezaba y tragaba, not la presa. No quedaba mucho como para ver que fu, pero un poco de cuero con pelo caf pareca de un antlope y estaba en el zacate junto al guila. Verla cazar y transportar su presa hubiera sido un espectculo. Ahora ella estaba lista para una siesta. Mientras el sol se acostaba, mir una ltima vez sus ojos amarillos, preguntndome sobre qu pequeo detalle estar viendo con su visin aguda. Entonces era tiempo de ir al campamento.